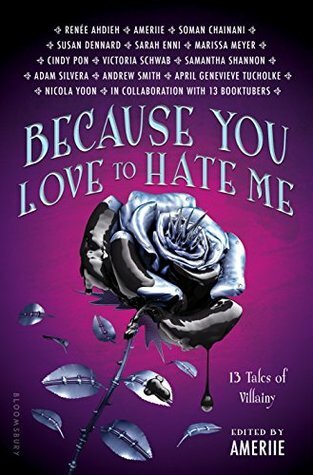 Sign into Goodreads to see if any of your friends have read Because You Love to Hate Me. 15.0% "I was underwhelmed at first, but I like the stories. Not sure how much I'm getting out of the booktuber interludes, but after the first one I'm feeling better about them. (The first booktuber one was... bizarre, and not funny. Kinda marred Renee Ahdieh's cool story.)" 33.0% "Really enjoying Susan Dennard's YA Sherlock Holmes short, despite being very aware of how this is going to end badly. I'm hopeful that it's a deliciously evil ending. I don't find Moriarty as compelling as I probably want to, but it's very readable." 45.0% "I'm feeling underwhelmed. The youtuber interludes are distracting, and I wish that the authors had little bios after their stories. As it was, I found Sarah Enni's story to be deliciously dark and was disappointed to see I can't find any other books by her... yet."